We've made it to the month of November and the end of the regular CSA season, the ultimate time of transition at PFP. The decline of pick-your-own crops signals the end of the outdoor growing season and a move to storage vegetables and fresh greens from the high tunnels, all for a second winter CSA! The waning day length also tends to mark staff transitions, including my own at the end of the month. This warm fall brought with it a swift shift away from and abundance of cherry tomatoes and raspberries and toward the bare, frost-bitten stems that remain. We experienced one frost in mid-October that seems to have set this change in motion. This fall marks the last season for pick-your-own okra at PFP (for now, at least), which has been a contentious topic lately! If any members want to know more, I encourage anyone to ask the farmers, and I also encourage folks to trust the farmers' insight! One begins to feel a bit beaten down after putting their heart into this work and then receiving an inordinate number of complaints, all about a single crop. Beautiful okra seedlings are always available during the PFP plant sale in May; we encourage okra lovers to bring some home to grow in garden beds or in containers! By now, all fall cover crop has been sown and has had a chance to grow. At PFP, two common cover crop combinations are used in the fall: rye and vetch, one combination, is wilted by cold and covered with snow, but then sprouts in the spring for a thick cover that provides nitrogen (vetch is a legume), and it serves as a source of organic matter once it is mowed and tilled in. Another combination, oats and peas, grows vigorously until the winter cold kills it, and it does not sprout again in the spring. For this reason, it is used now where early-season crops will be planted in 2018! Aside from the benefits I mentioned above, cover crops are crucial winter erosion reducers; their root system and above-ground growth keep soil in place and reduce the speed of water runoff. After learning that okra would no longer be grown at PFP, I promptly notified everyone that I'd be resigning as a PFP farmer. That's most definitely a joke. However, since coming to PFP (with no growing experience) as an intern in 2013 and then working the 2014, 2016, and 2017 seasons, I've begun to get excited about a new project, and my partner, Nicholas, and I will finally embark on it this fall. In the last couple of days of November, we will make a big move, and will start to develop a small farm on a 9-acre piece of hilly and diverse land outside the city of Menomonie, in western Wisconsin. Folks who know me are likely aware that the Twin Cities area is a sort of a second home, and Nicholas grew up less than 2 hours' drive from our new farm. As part of this project, we aim to sell at farmers' markets and to start developing a CSA, producing vegetables and fruit using heavy mulch and working toward a stable, no-till system at a scale that is people-friendly. While we work to expand production to fruits like apples and pears (and nuts, starting with hazels), we will begin creating workshop and living space in one of our barns, to eventually host artist residents and farm interns. We are aiming to foster diverse, farm- and art-focused community, and to work with folks in Menomonie (including UW students in town) and nearby farmer friends to explore how food production and art intersect. Nicholas and I will also work hard to create an open and safe environment for people who, like myself in the past, associate rural areas and rural farmers with prejudice and hostiliy: queer people, people of color, and even 'progressive' young people in general. I am extremely excited to begin this work, and I am grateful indeed to all of the mentors and co-workers with whom I've connected at PFP. I first arrived at Poughkeepsie Farm Project in May 2013 with essentially no growing experience, and 11 months of training later I identified crops and weeds, could manage pests, operated tractors, used power tools, identified and responded to plant diseases, and repaired irrigation lines (among other things), and my skill at handling high-stress situations improved significantly. Being able to stay at PFP for additional seasons allowed me to get to know our members much better and to improve farming, management, and interpersonal skills. Because of PFP's location, it is possible to join the farm crew without owning a car, which helps to make employment accessible: it played a big role in making my transition from urban life to the farm internship possible. 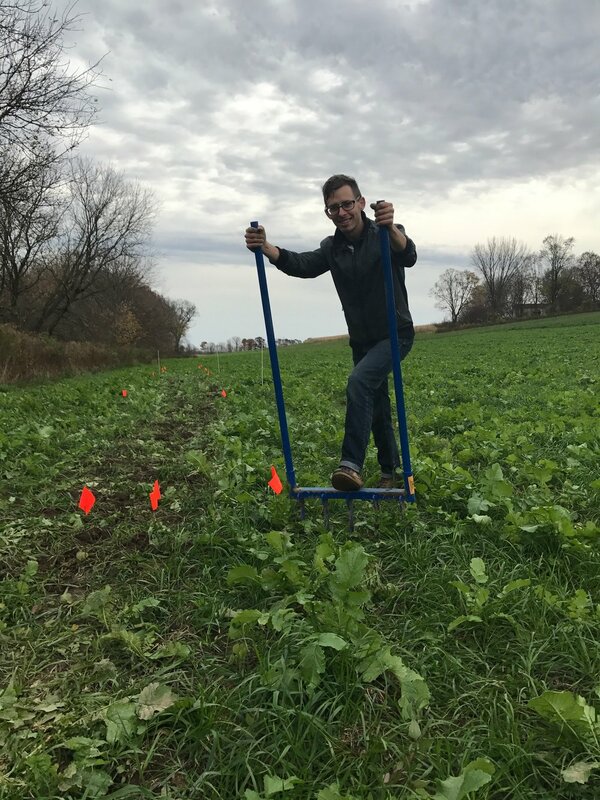 During the last full week of October while working at PFP, I was excited to receive live text and photo updates from Wisconsin, where Nicholas and Liz (one of PFP's 2017 summer interns) were first breaking ground to plant garlic for next season. PFP's garlic for 2018 is finally planted now (next to the blueberries this year), and fall cleanup and root crop harvests are still underway. I am very happy that after I leave, the PFP farm crew will still be bursting with good energy. I look forward to winter updates, especially since the crew will be putting to good use the skills/patterns/problems that were learned and/or observed last year. I wish everyone a terrific rest of fall into winter. Thanks and farewell!